(left) Aoi Miyazaki and (right) Eita in Su-ki-da. The Skinny: A well-acted, if sometimes frustrating drama that eventually pays off by story's end --if you're willing to put up with the journey. Review by Calvin McMillin: Saying "I love you" has never been so hard - or taken quite so long. At least, that's the impression I take from director Hiroshi Ishikawa's 2005 project, Su-ki-da. It's an involving drama that may test the viewer's patience, but its eventual delivery of a simple, rewarding coda pretty much justifies the opaque, minimalist, and sometimes tedious choices that typify most of the film. Su-ki-da's narrative is divided right down the middle, separated by two eras. In the first half, we are introduced to Yu (NANA's Aoi Miyazaki), a seventeen-year old girl who has a crush on her classmate Yosuke (Eita, from Summer Time Machine Blues). As the narrative unfolds, we learn that Yosuke was once a gifted baseball player, but for reasons unexplained (and will also remain so), he has now decided to embark on a career in music. He's picked up the guitar and even composed the beginnings of a catchy song - one that immediately grabs Yu's already rapt attention. Although we are shown little in the way of conversation between Yu and Yosuke, a budding friendship seems to be in the works. Unfortunately, Yosuke has inexplicably taken a fancy to Yu's older sister (Sayuri Oyamada). It's a strange choice, as not only is she in mourning over the death of her boyfriend, but she also seems, at the very least, somewhat mentally unbalanced as a result. Yu ends up encouraging her sister to meet Yosuke, sacrificing her own happiness for that of her grieving sister and the boy she so clearly loves. This meeting lifts the spirits of Yu's sister, but just when Yosuke seems ready to verbalize his feelings (whatever they may be) to Yu, EVERYTHING GOES TO HELL. Twice. Yeah, you knew it was coming. Flash forward seventeen years, and we find a grown-up Yosuke (Hidetoshi Nishijima), who claims via voiceover to be making ends meet on the fringes of the music industry. From that description, one expects him to be working as a local musician living from gig to gig, but the sad truth is he's actually given up playing the guitar and now works as a sound technician. Of course, the inevitable reunion with Yu is just around the corner, but not without an unexpected detour. 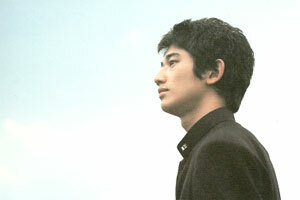 Outside the studio, he stops a would-be thief (Ryo Kase) from robbing a woman passed out on the street (Maho Nonami). It's a noble gesture, but Yosuke's Good Samaritan act will end up having unexpected consequences later in the picture. Naturally, one wonders whether the woman Yosuke saves will turn out to be the down-and-out, grown-up version of Yu, but (Spoiler alert!) she's not. But that's not to say the woman doesn't serve a purpose. Unable to get an address from her, Yosuke takes her back to his apartment to let her sober up. When she comes to her senses, the two end up having a conversation that sparks some memories from Yosuke's past. And as fate would have it, Yu (now played by Hiromi Nagasaku) walks back into his life not too long after. The two reunited friends are finally able to reconnect and Yosuke takes stock of his life. He makes a few bold moves to change his life for the better, but wouldn't you know it? EVERYTHING GOES TO HELL again! Can't these two potential lovebirds get a break? Well, if it's any consolation, there's still ten more minutes to the story. Although filled with beautiful imagery and some strong acting performances (particularly from the two Yu's: the heartbreakingly good Aoi Miyazaki and Hiromi Nagasaku), Su-ki-da has an odd quality to it. For me, I experienced a good measure of frustration with the story, and yet, when all is said and done, it's a film that has stayed with me. Ishikawa definitely has some stylistic quirks that may not be to everyone's liking. For one, there's minimal dialogue throughout the film, which is only magnified by Ishikawa's preference for holding shots a bit longer than one might expect, not to mention his lingering, often repetitive shot-reverse shot compositions. In other words, the actors don't talk much and frequently end up staring either at each other or at nothing at all for inordinate amount of time. It's a tension-building technique that is perhaps meant to pull you into the film, but it feels a bit overused. Ishikawa also has a tendency to let characters drift out of the frame, especially at times when their expressions are crucial to reading exactly what's going on in the given situation. Is it inventive camerawork or an unnecessary distraction? For me, it bounced back and forth between the two. Your reactions may vary.